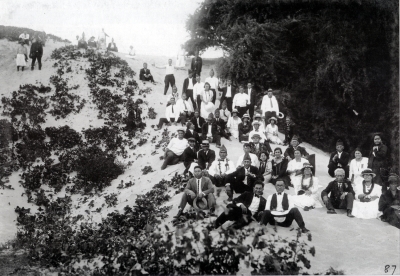 Members of the Order of Kamehameha enjoy at day at Barking Sands Beach, Polihale, Kauaâ€˜i, 1928. Prince Kuhio helped found the Order of Kamehameha on May 13, 1903. Photo by Tai Sing Loo. HHS #1835. Tai Sing Loo, “Barking Sands Beach, Kauai,” Hawaiian Historical Society Historical Photograph Collection, accessed April 21, 2019, http://www.huapala.net/document/13.